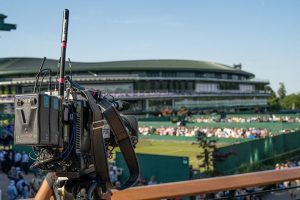 As it embarks on its first Wimbledon as host broadcaster, Wimbledon Broadcast Services (WBS) is working not only with its technical partner NEP but also a string of service providers that are helping it to achieve its ambitions. Among the suppliers are MOOV, who is responsible for branding the on-screen graphics, Aerial Camera Systems, the specialist camera provider, and Broadcast RF, the wireless camera systems company. 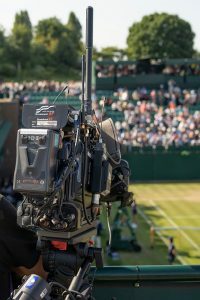 The client-supplier relationships differ depending on each company but can be either direct, between the All England Lawn Tennis Club (AELTC) and the service provider, or via NEP, as AELTC broadcast manager Bethan Evans explains. “We can do the contracts directly when it works for us and then NEP has sub-contractors too where they are more embedded in their systems. There is a real mixture. With Broadcast RF, for example, that is a direct contract with AELTC. That gives us the control and the chance to get the best out of the RF model. And then with others, we recognise that NEP is best-placed to do the sub-contracting. Broadcast RF, part of the Euro Media Group, is providing the wireless camera network for WBS. The RF receive infrastructure features 36 antennas spread over the site, allowing cameras to go pretty much anywhere. And during Wimbledon, they do exactly that. In Centre Court, operators can wander from the back row of seats right the way down to grass level. 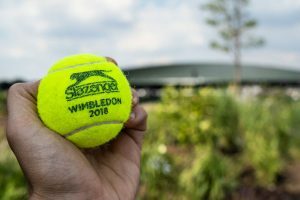 Throughout the club grounds, wireless crews can be anywhere up to and including ‘The Queue’, the line of fans waiting outside AELTC in the hope of getting a ticket to see some tennis. 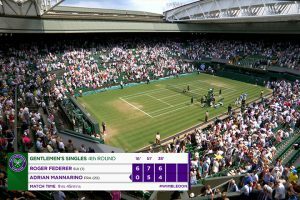 The RF set-up for Wimbledon 2018 is “broadly similar” to previous years, says technical project manager Nick Fuller, but of course, the client is different now with WBS calling the shots. Where there is a big change is in the number of broadcasters using the RF network. 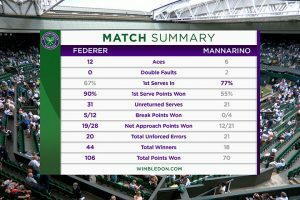 In 2017, it was eight clients, including the host and the Wimbledon Channel. This year it is 10. Another major change is that Centre Court coverage is now UHD and HDR. “Because it is Hybrid Log Gamma (HLG), it doesn’t really worry us,” says Fuller. The biggest challenge is ensuring that the Broadcast RF equipment “doesn’t stick out like a sore thumb,” he says. The wireless monitor is usually operated by non-technical staff so it “just has to work”. One interesting new addition for 2018 is the option to allow crews to have wireless monitors (pictured, left) as well as cameras. 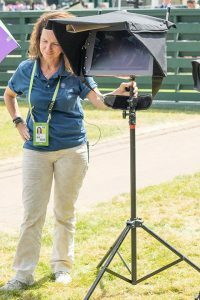 “Some broadcasters want a roving monitor so that presenters can commentate on VT clips,” says Fuller. Aerial Camera Systems, also part of the Euro Media Group, is providing 36 remotely operated cameras across three distinct areas for WBS: the press room; beauty shots; and court-side. On Centre Court, that consists of five Sony HDC-P43 UHD point-of-view cameras, including a baseline track and an umpire camera. There are also three Sony HDC-P1 cameras on Court No.1 and several more across various outside courts. Each court-side camera is mounted on a remote SmartHead2 (some with arms) and is controlled from inside the relevant OB truck. Each truck has two operators who are responsible for all of the available remote ACS cameras. A programmable shot box allows for repeat moves and positions. For beauty shots, all rights holders have access to the live ACS camera feeds with shots called for via the host QC. One of the cameras, attached to the Clubhouse, is fitted with a Canon UJ90 box lens and SmartHead3 to capture skyline shots across London. As with the court-side cameras, operators control more than one camera and thanks to a rota system, a crew member is available to react to shot requests at all times during the day. Operators are based deep within the Broadcast Centre. In each case, ACS provides the full camera system for WBS including the head, the lens, the camera and the base station. In some cases, it also supplies the vision engineers to operate them. In total, ACS has 30 staff working on the Championships during over the fortnight. “The UHD is the big change for us this year as it required significant investment in a new generation of camera channels, the P43s,” says ACS sales director Matt Coyde. ACS is also delivering the iconic ‘aerial’ hoist shots of the All England Club in UHD/HDR. MOOV is the company responsible for branding the on-screen graphics for WBS. For 2018, it has created a huge bouquet of bespoke graphics elements including stings, wipes, large scoreboard content and the entire match and presentation graphics pack. And everything was created in advance, as MOOV director Nev Appleton explains. The Wimbledon logo has also been made more prominent this year, he adds. During the Championships, MOOV also has two teams of operators and coordinators on site at the AELTC, controlling graphics playout using their own tennis software to drive ChryonHego systems. One of the teams serves BBC Sport for presentation and data graphics across BBC1 and BBC2, an arrangement that has been in place done for the last 15 years. The second team works directly for WBS on The Wimbledon Channel and also the World Feed. “What WBS has achieved in such a short space of time is remarkable,” says Appleton.